With summer approaching, I’m getting into the mindset of meals that require small amounts of cooking, are portable, and feel lighter than my winter fare. 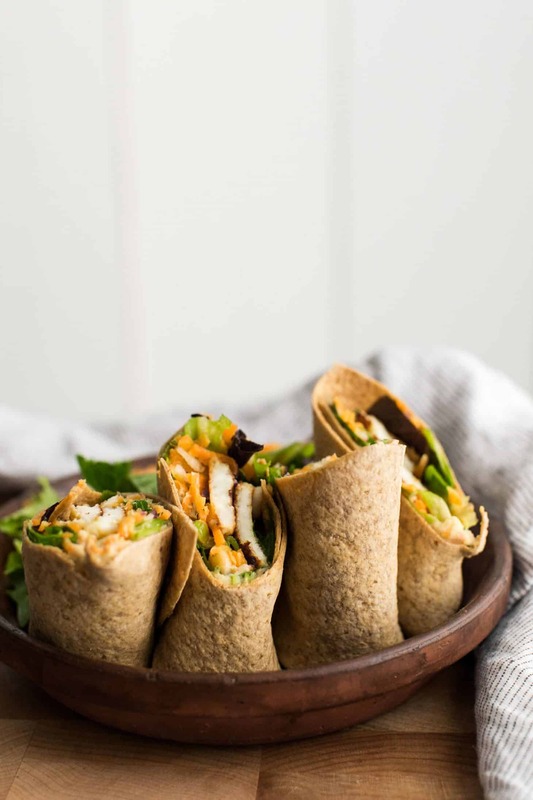 Wraps come in handy whether I’m packing a healthier lunch for M or a picnic to go exploring. These hummus wraps are a favorite of mine. 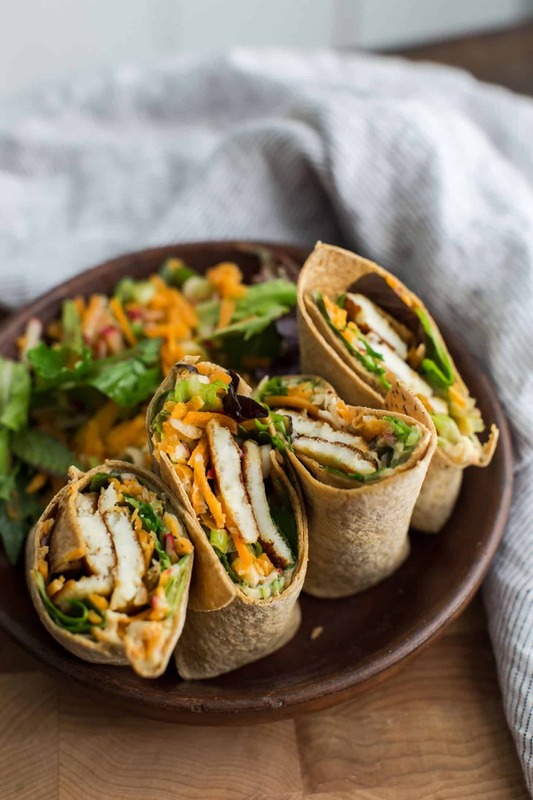 A simple salad paired with a layer of hummus and salty-fried cheese (because I believe in a solid balance) all rolled in a light Flatout wrap. 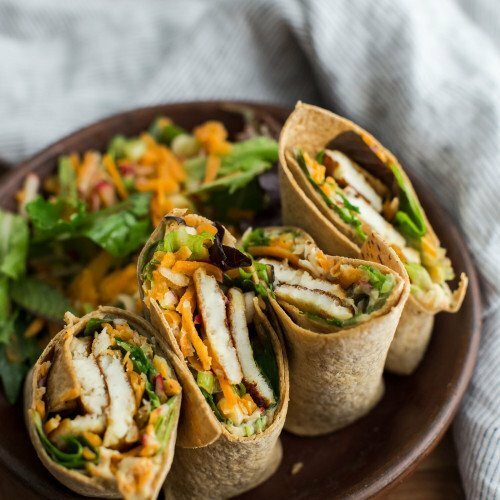 It’s the perfect way to pack a healthy lunch without too much effort. My ideal lunch: salty cheese paired with fresh vegetables and homemade hummus. Look for halloumi in the cheese section of your local Co-op, Trader Joe’s, or Whole Foods. Wash, dry, and place lettuce in a bowl. Using a box grater, shred the carrots and radish. Add the carrots, radish, and minced scallions to the bowl with the lettuce. In a small jar, whisk together the olive oil, lemon juice, salt, and pepper. Pour over the lettuce and toss until well coated. Cut the halloumi into 4 slices, roughly 1/4″ thick. Heat a frying pan over medium-low heat. Add the olive oil, swirling the pan around to cover the bottom. Lay the halloumi in the oil and fry until golden brown, about 3 minutes. Flip and fry for 2 to 3 more minutes, until both sides are golden. Transfer halloumi to a plate. Assemble wraps by spreading 2 tablespoon of hummus about 2″ from the edge closest to you. Layer with half the salad mixture and two slices of halloumi. Roll, tucking the sides in as you go. Cut in half and repeat with remaining wrap. 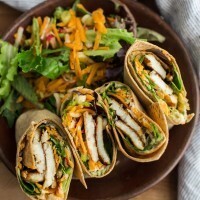 Tips and Tricks: Other vegetables that would work well in this wrap include cucumbers, grilled zucchini, or mushrooms. It’s no secret that I love hummus on sandwiches (specifically grilled cheese). However, A grilled cheese can feel fairly heavy (depending on the bread and cheese). This hummus wrap is a great on-the-go, lighter solution. Cheese: Halloumi is a bit on the pricier side and not always easy to find. If you’re looking to swap something else in, try fried tofu (a great vegan version) or a crumbly, salt cheese (like feta). Hummus Flavor: Step up your hummus game. Make your own with roasted garlic, herbs, roasted red pepper, or sriracha for a bit of heat. Greens: Use whatever greens you might have on hand: kale, spinach, or a mixture of all the greens can be a nice addition. These Flatout wraps are easy to work with (very soft/pliable) and perfect for an array of fillings. I also love their stone-ground wheat and their gluten-free option. 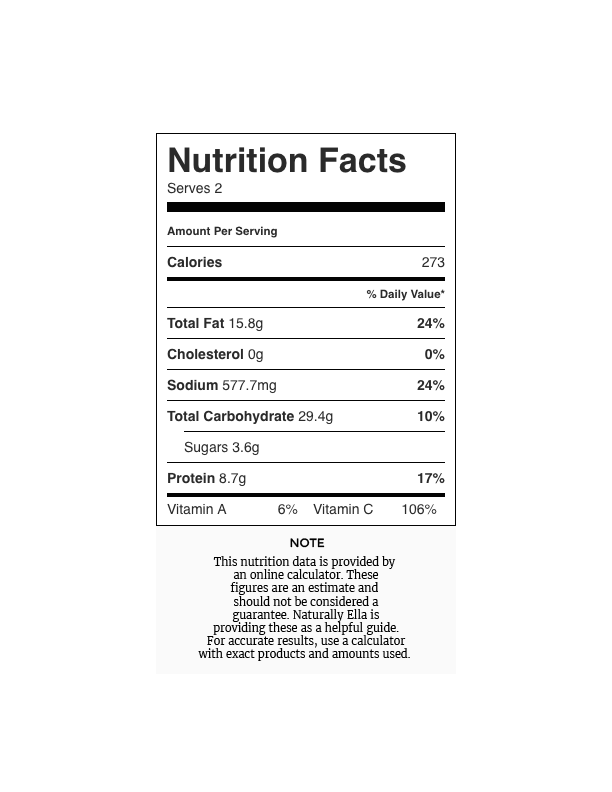 I usually stick with the equation of greens, beans, and cheese but you can easily vary based on what you have on hand or are in the mood for. This is such an easy and delicious recipe! Perfect weeknight lunch / dinner! Plus the pan – fried haloumi looks so delish with all the veggies and hummus!!! The recipe looks amazing but I am surprised that you would be using a product like flatouts which contain GMO’s and many other unhealthy ingredients. This product does not look like something that would fit into you or your readers healthy lifestyle. What bread would you suggest using for this? I’m still learning about healthy alternatives and GMO’s and am interested in what other bread could be used instead. Thanks! Hi Rhonda, I actually recommend making your own wraps (http://www.100daysofrealfood.com/2010/05/26/recipe-whole-wheat-tortillas/) but if that’s not an option, here’s a website that provides a list of baked goods (with quite a few bread companies) that you can look for: http://nongmoshoppingguide.com/brands/breads-and-baked-good.html. I never thought about hummus in grilled cheese! It sounds delicious! This looks so delicious and I love the video. You make it look so easy! This looks so delicious and easy to make. An easy meal. Thank you for this recipe, it looks delicious. We are on the same page with meals to go for the summer. Let the camping/exploring begin! All of my favourite things wrapped up together. YUM! I just want to take these on a spring picnic or a hike. So good looking! I’ve been seeing a lot of halloumi in recipes lately and I was bummed when I couldn’t find any. I used cotija cheese though, which worked pretty good as a replacement. Yum, looks tasty and I love halloumi!! Do you have any recommendations on where to find halloumi in the Sacramento area? Thanks! If you have an international market, look there. I buy halloumi at a market that’s primarily Turkish and middle eastern foods, and it’s cheap — $7/lb, maybe? I’ve made this recipe twice (with homemade naan-style flatbread) and it is AMAZING. Just ate last night’s leftovers for breakfast. Quick question: my halloumi stuck to the pan something awful. Of course I scraped it all up and ate it anyway, but any tips for frying it without it sticking? I used a Le Crueset enameled cast-iron pan, heated pretty hot before adding plenty of oil. I sometimes have trouble if I try to flip it too soon. Usually when the crust has formed on the cheese, it flips a bit easier! Erin, I just wanted to tell you that I’ve now made this recipe a half a dozen times, and it’s one of my all-time favorite things to eat! 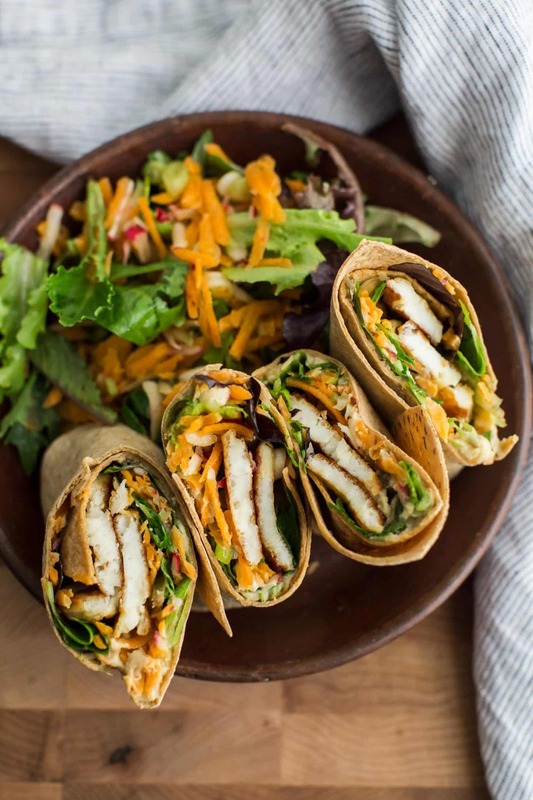 I can’t seem to branch out and try any other halloumi recipes, because I always want to make these wraps. A friend recommended coating the halloumi slices with a dusting of cornstarch before frying, and between that and being patient enough to wait before flipping, as you suggested, I’ve had much more success. Hi- the brands that I’ve found do not contain annimal rennet- it’s all microbial or vegetarian rennet!